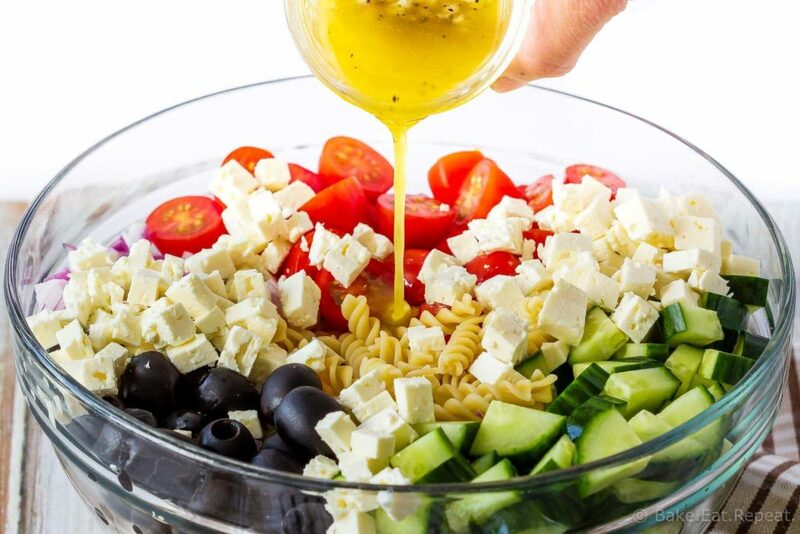 This Greek pasta salad is the perfect side dish – quick and easy to make and everyone loves it! Add protein like chicken or shrimp to make it a full meal! We love pasta salad in the summer. Those hot summer nights just call for cold meals like pasta salad. Last summer we were all addicted to this Mexican pasta salad with Cajun shrimp. It’s amazing. Speaking of which, I need to make that again soon! 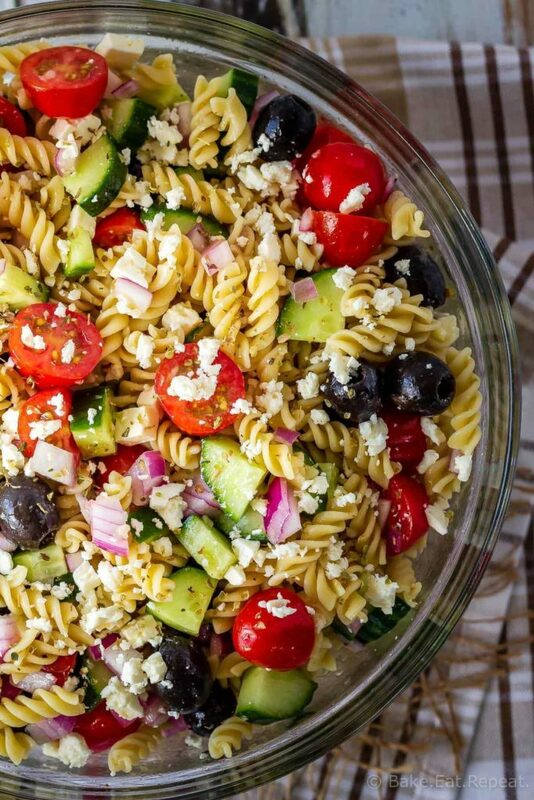 This summer though, Greek pasta salad is calling my name every time I want an easy, make ahead side dish. Or a quick main meal if you serve it with some grilled chicken or shrimp. My whole family loves this Greek pasta salad. But then, they all love regular Greek salad too so that didn’t really come as a surprise to me. I know not all kids love black olives and feta cheese, but mine are a little strange that way and have always loved both. They don’t like kalamata olives so I always use black, but you could definitely use kalamata olives instead if you prefer. I do usually leave the red onion out and just serve it alongside so my husband and I can add it but the kids don’t have to. They end up picking it out and it’s just not worth it when they love everything else about this pasta salad! And the best part about this Greek pasta salad? You can easily make it ahead of time so that you’re not busy cooking during the nicest part of the afternoon. If you’re bringing it somewhere you can mix it up ahead of time – or you can leave the dressing separate and toss it together when you’re ready to eat – either is fine. The worst part is that if your family is anything like mine, you probably won’t have any leftovers. Everything can be made up ahead of time, all the ingredients chopped and combined and the dressing mixed up. Depending on your pasta you can toss everything together ahead of time too. I have found with cheaper pasta brands they tend to get mushy when mixed with the dressing ahead of time, but if you’re using a good brand of pasta it should be fine for a few hours, and the leftovers are usually fine the next day or two as well. We usually leave the red onions separate and just add them at the table since my kids don’t like them, so that’s an option if you have similar strong feelings about onions in your house! I like fusilli pasta in this salad, but any short pasta shape will work fine here. 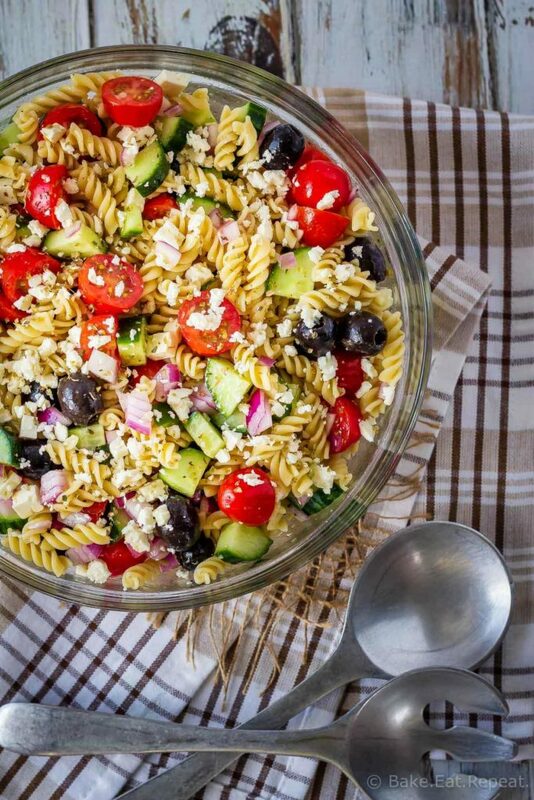 This Greek pasta salad is the perfect side dish - quick and easy to make and everyone loves it! Add protein like chicken or shrimp to make it a full meal! Cook the pasta in salted, boiling water until al dente, according to package directions. Drain, rinse with cold water, and set aside. In a small bowl, whisk together the olive oil, lemon juice, garlic, salt, pepper, and oregano. Set aside. In a large bowl, combine the cooked and cooled pasta, the tomatoes, cucumber, black olives, red onion and feta cheese. Drizzle the dressing over top and toss lightly to combine everything. Serve immediately, or refrigerate for several hours until ready to serve. Leftovers keep well for 2-3 days. Lovely. And so satisfying. Mediterranean and especially GReek flavors and ingredients are just the best!! !